Have you had your eye on the new Chevy Malibu, but are overwhelmed by the engine options? Mike Anderson Chevrolet of Merrillville has the details you’re looking for. In this page, we’ll break down each Chevy Malibu engine option by engine type, specs, and other performance features offered. Continue reading to learn more about how each of these engines can benefit your daily drive. For more details on the 2019 Chevy Malibu, browse our Malibu trims research. You can also receive a great deal on the Malibu when you take advantage of one of our many special offers. For more information, please don’t hesitate to contact our Chevy dealership near Crown Point, IN by calling (219) 947-4151. The 2019 Chevy Malibu engine options are impressive and diverse. From fuel-saving technology to sporty, responsive handling, you’ll find the exact performance you’re looking for. You have the choice between two gas-powered turbo engines and an efficient hybrid engine. Look below to see Malibu engine sizes and trim availability. How many miles per gallon does the hybrid engine offer? What is the horsepower rating for the 2.0L turbo engine? In the table below, you’ll find 2019 Malibu engine specs and miles-per-gallon ratings to help you make a decision. 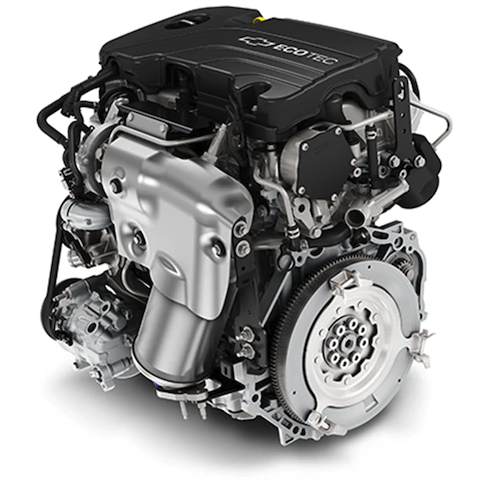 The 1.5L turbo engine is equipped with a continuously variable transmission (CVT) and front-wheel drive. The benefit of this single-speed transmission is that it seamlessly shifts through a number of gear ratios, offering better shifting and fuel economy. If you choose the 2.0L turbo engine, you’ll get the 9-speed automatic transmission and front-wheel drive. The hybrid engine, on the other hand, has an automatic hybrid transmission that was engineered specifically for this engine.